Where was Chick-fil-A’s first restaurant? A look back at the mall food court that made history. 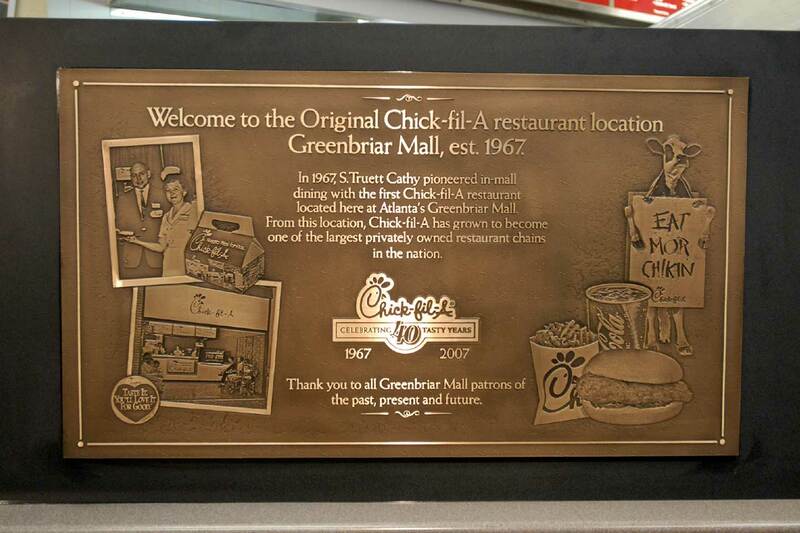 On Nov. 24, 1967, Truett Cathy altered the “fast food” landscape forever when the first Chick-fil-A restaurant opened in Atlanta’s Greenbriar Mall, an idea as original as his Chicken Sandwich. At the time, the concept of a shopping mall restaurant was groundbreaking, fitting for this mall in particular, as it was one of the first indoor malls in the Southeast. And while the restaurant itself was not very large, just 384 square feet (roughly the size of a two-car garage), it had a monumental impact. While there are more than 50 items on the current menu, ranging from a Superfood Side salad to Frosted Coffee, in 1967 customers could order just a few classics: the Original Chicken Sandwich (which was just 59 cents), salads with boneless chicken breast, coleslaw, lemon pie and lemonade. Potato fries were also available; however, it would not be until the mid-1980s when Waffle Fries would be added to the menu. Team Members in the original restaurant donned uniforms much different than those of today including candy-striped aprons, ascots, “soda jerk” hats and ties. While still located in the Greenbriar Mall, the original restaurant has moved across the hall, home to a tuxedo rental shop, while the current restaurant is in a much larger spot. 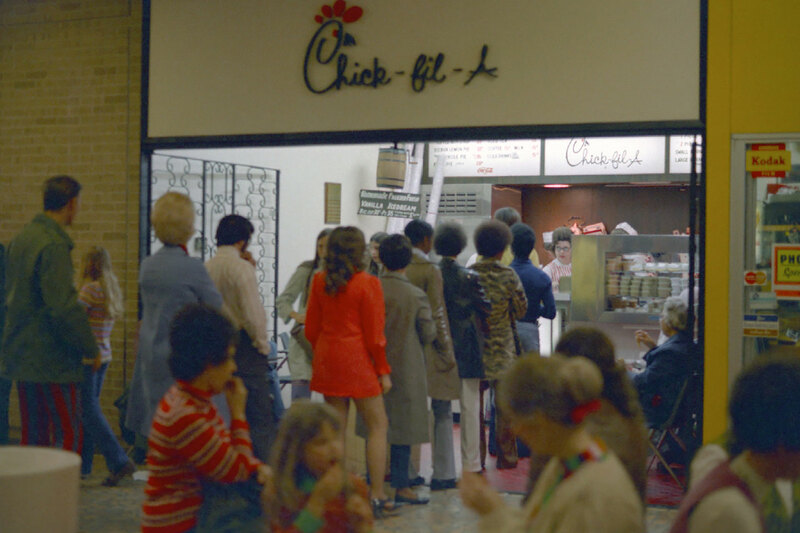 In 1967, there was just one Chick-fil-A restaurant Operator, Doris Williams. She was a small business owner who led her team to run the restaurant every day (six days a week, of course!). Today, local franchise Operators run more than 2,300 restaurants from coast to coast. Yes, a lot has changed over the past five decades, but a few things have stayed the same like Chick-fil-A’s dedication to give back in the communities it serves, remaining closed on Sundays and of course the Original Chicken Sandwich itself. It’s a familiar sight to millions of people nationwide – the red beak profile and scripted name that stands as a symbol of the Original Chicken Sandwich. It’s the logo that greets customers on Chick-fil-A restaurants in 47 states and Washington, D.C.
Pickles have been a part of the original Chick-fil-A Chicken Sandwich from the time Chick-fil-A founder Truett Cathy invented it. Those who have enjoyed a Chicken Sandwich are familiar – two perfectly ripened pickle slices, carefully placed on each bun. As a stay-at-home mom to five boys, Lindsay Watts rarely stays at home; her days are filled with school carpool lines and endless errands. On a recent afternoon, as Lindsay and her 5-year-old son headed to pick up their weekly, mid-errand lunch at Chick-fil-A Larkridge in Thornton, Colorado, her car was sideswiped. Thankfully, the only damage was to the car, but this meant their lunchtime would be spent dealing with paperwork and local police instead of chicken sandwiches.